Golden Nugget features one of the latest retail sportsbooks in New Jersey, opening its temporary NJ sports betting operation Aug. 15. Now, the casino is the first to boast a permanent sportsbook in Atlantic City. Regulatory approval from the NJ Division of Gaming Enforcement came through Friday, allowing the Golden Nugget sportsbook — known simply as The Sportsbook — to open its doors at 5 p.m. ET. The confirmation came from emails with the AC casino. A virtual tour of the space, posted by the casino on its Facebook page, does not disappoint. The Sportsbook, powered by SBTech, will feature five video walls and more than 50 TV screens. Additionally, bettors will have access to nine betting kiosks and four cashiers at the sportsbook, which can seat 100 patrons and includes 16 lounge chairs. 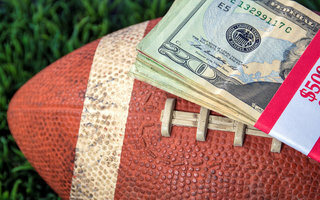 The Sportsbook will accept wagers Friday from 5 p.m. to midnight. Starting Saturday, regular hours will run from 10 a.m. to midnight. Interestingly, Golden Nugget nearly missed the deadline set by the DGE in July. An eleventh-hour submission for the casino’s sports betting plans just beat the buzzer. The casino introduced its temporary sportsbook, which sits in Golden Nugget’s old poker room, two weeks ago. Hopes for The Sportsbook were nearly dashed before legalized sports betting was even approved in the Garden State. An original version of the bill prohibited casino operators who had any ownership in teams from offering sports betting. That bill was amended to prohibit any casino owner with more than a 10 percent stake in a team from offering wagering. Fortunately for Golden Nugget, whose owner, Tilman Fertitta, also owns the NBA’s Houston Rockets, the casino received a reprieve. As a result, The Sportsbook can offer regulated sports betting, just not on NBA games. Grant Lucas is a longtime sportswriter who has covered high school, collegiate, and professional levels. A graduate of Linfield College in McMinnville, Grant now focuses his attention on the growing NJ online gambling and sports betting scene.